Once upon a time there was a young boy who grew up in Nashville, Tennessee as the oldest of four kids, raised with love and guidance under the watchful eye of Dad, Archie (a building contractor) and mother, Margaret (a registered nurse). This young boy spent many wistful hours in the mid-south hills milking the family cow "Rosemary" and dreaming of a career as a singer and entertainer. This young dreamer would eventually grow to be honored and respected as one of the few true entertainment Legends and honored humanitarians of this century. Beginning with his first appearance on the "Ted Mack Amateur Hour", and continuing through his many award winning albums, hit movies, chart topping bestsellers, world-wide tours, diverse business involvements and wide-reaching charitable efforts, he touched and deeply inspired the lives of millions of people - worldwide! To this day, he continues - spreading his message of music, love of family, compassion, understanding, hope and love and faith. Pat Boone's career has included numerous motion pictures, hosted his own TV Show in the 60's and of course his recording career resulted in some of the most popular hits of the 50's and 60's.Some of hit songs include "April Love", "Love Letters In The Sand", "Moody River", "Tutti Fruti", "Long Tall Sally", "I Almost Lost My Mind", "No Arms Could Ever Hold You"and many more. 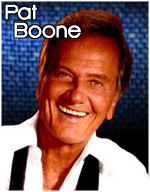 Pat Boone continues to perform to sold out concerts across the country and is still appears on television and radio.